The 2017 Wyoming Cattle Industry Convention and Trade Show was held June 6-9 at the Bomber Mountain Civic Center in Buffalo, Wyo. 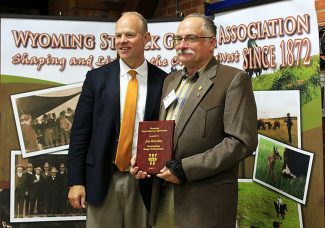 The convention revolved around the theme "Johnson County — the Peaceful Re-Invasion" focusing on the history of the Johnson County cattle wars and providing educational events for convention attendees and local community members to improve their ranching operation. According to WyoHistory.org, on April 5, 1892, 52 armed men rode a private, secret train north from Cheyenne. Just outside Casper, Wyo., they switched to horseback and continued north toward Buffalo, the Johnson County seat. Their mission was to shoot or hang 70 men named on a list carried by Frank Canton, one of the leaders of this invading force. The men included some of the most powerful cattlemen in Wyoming, their top employees and 23 hired guns. The invasion resulted from long‑standing disputes between these cattle barons, who owned herds numbering in the thousands, and small operators, most running just enough cattle to support their families. The famous Johnson County War has been called "the most notorious event in the history of Wyoming." The conflict between the cattle barons and Buffalo residents dates back to 1883, with conflicting newspaper stories. The Johnson County papers counter other Wyoming papers that claimed Buffalo was home to "the most lawless town in the country," or a haven for "range pirates" who "mercilessly" stole big cattlemen's livestock. Needless to say, cattle producers visiting the town for this event, left their firearms behind, and came in peace. 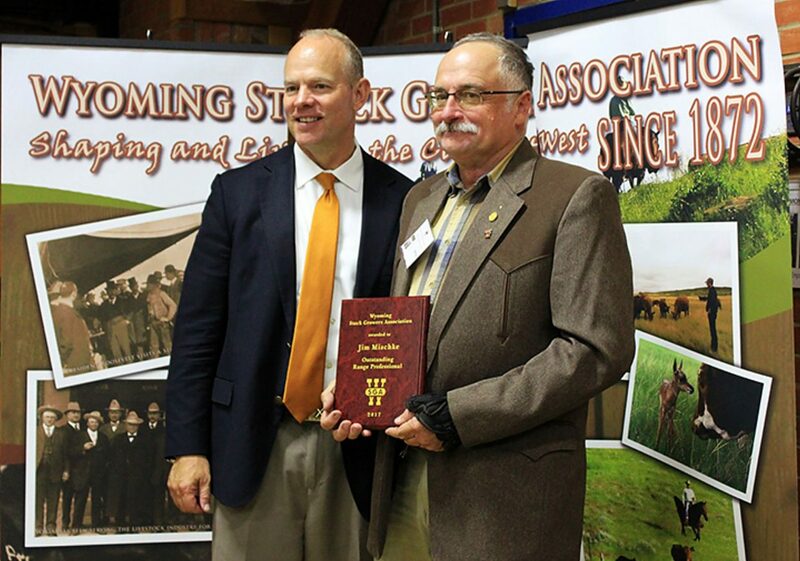 Hosted by the Wyoming Stock Growers Association, the annual convention was open to members, non-members, state and local media and featured motivational keynote speaker, Bruce Vincent. Vincent, a third-generation logger from Libby, Mont., has given motivational speeches throughout the U.S. and the world for more than 25 years. He has testified on natural resource issues before Congress and has appeared on several news programs such as "60 Minutes." Vincent has been named Timberman of the Year, in Montana; National Forest Activist of the Year; the Agri-Women's 2007 Veritas Award Winner; and in 2004, Vincent received the inaugural Presidential Preserve America Award from President George Bush. Guest speaker, Wyoming Gov. Matt Mead, discussed a number of topics including Waters of the United States (WOTUS); the Endangered Species Act; the "Data Trespass Law;" and Economically Needed Diversity Options for Wyoming (ENDOW). Mead said Wyoming was one of the first states to challenge the WOTUS, and is pleased that President Trump has ordered a review of the rule. He hopes to see the rule reversed, as it will be a detriment to the economies of western states and in particular to the agricultural industries in those states. The Endangered Species Act needs revisions, he said, because what is being done now is resulting in a paltry success rate for getting species off of the list once they are on it and is also creating economic hardship for Wyoming and other western states. The governor also applauded the recent decision to remove the wolf from the list and return management to the state, and discussed the possibility of removing the grizzly bear from the list, and continued efforts to keep the sage grouse off of the list. Mead also touched on the state's Data Trespass Law, which was passed by the legislature in 2015 and subsequently challenged as unconstitutional by the Western Watersheds Project. The legislature amended the law in 2016 and the complaint by the Western Watersheds Project was also modified. Since then, the state moved to dismiss the case and a federal court agreed with the state, but an appeal has been filed in the case. Mead also discussed ENDOW, which will potentially diversify the state's economy. "For decades we have wanted to grow opportunities that keep our young people in Wyoming," Mead said. "We have known for more than 50 years that it is important to add value to our natural resources, to improve air service and to expand research. The problem with the past plans is that they have addressed the next four years — or next eight years. These are connected with political terms and we need economic action that spans the next 20 years — efforts that go beyond this governor and the next," Mead said ENDOW began in 2016. 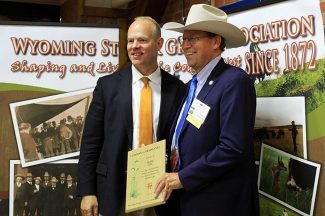 He also stressed the importance of opening new markets, such as Asia for Wyoming's beef and other ag products, that will help grow the state's economy in the future. "How do we tap into that?" Mead asked attendees. "It seems like opportunities are lost when other states are doing it and we're not." Several awards were presented, including the Leopold Conservation Award, part of the WSGA/Wyoming Department of Ag Environmental Stewardship Program. which was awarded to the Garrett Ranch, of Casper, Wyo. Using the money from the sale of his Texaco gas station in 1937, Labon Garrett, along with his father and grandfather, Henry and Adron, purchased the first 2,000 acres of Garrett Ranch. The ranch now belongs to Pete, Labon's son, and Pete's wife, Ethel, who manage the ranch activities with their children and grandchildren. The ranch is 30 miles south of Casper and still contains the original homestead property. 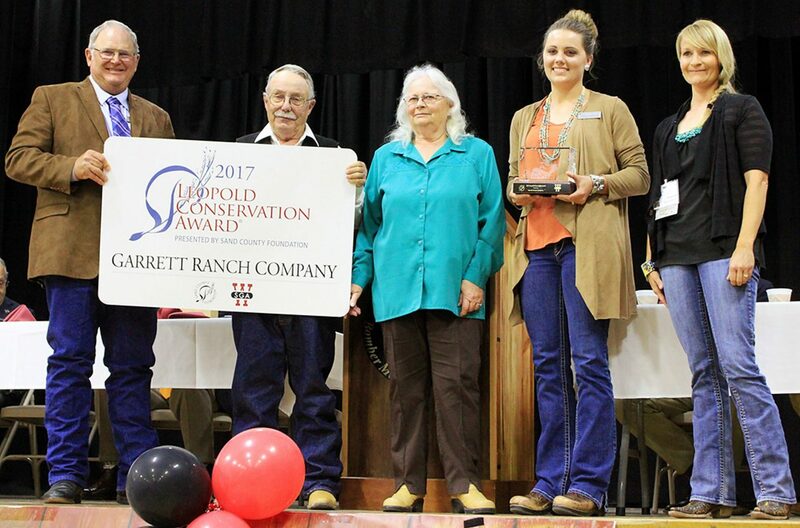 When the ranch was established, the Garretts began with 100 head of Hereford cattle. To this day the ranch still raises Herefords — "since Herefords paid for the ranch in 1937, I decided to keep them as the breed of cows that pay the bills every day," Pete said. 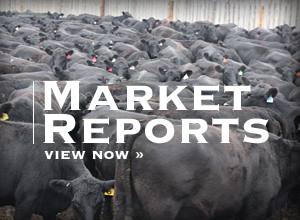 The herd has grown to 600 Herefords, grazed on move than 70,000 acres of deeded and state and federally leased land, and the ranch also contains 200 acres of irrigated alfalfa along the Bates and Stinking creeks. The Garrett's rotational grazing system was developed with the guidance of natural resource professionals to benefit their rangeland and wildlife habitat. Their system is a reflection of the family's conservation goals for the ranch, "to make life easier for wildlife, livestock and people who enjoy the outdoors." The family intends to continue their collaborative efforts with agencies and organizations that have provided and continue to provide investments into their ranch. Working with the Wyoming Game and Fish Department, Bureau of Land Management and other non-government organizations, the Garretts began the Bolton Creek Riparian Restoration Project. The effort focused on working with nature, letting beavers create a natural, stable channel with a fully functional floodplain that reduced streambank height and erosion. The Garretts care deeply about providing hunting and fishing opportunities on their ranch. They have a particularly soft spot in their hearts for first-time hunters and elderly hunters with limited mobility, so they took it upon themselves to reserve a large stretch of Bates Creek for youth and older hunters. Much of their ranch is enrolled in the Hunter Management Area program, adding to the large parcels of public and private lands that are open to the public for the benefit of sportsmen. 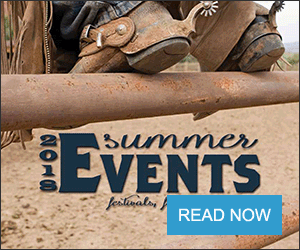 "The Garrett Ranch continuously adapts their land management to account for changes in range conditions," said Dustin Porter, president of the Area 66 Mule Deer Initiative. "Pete and Steve regularly seek new and innovative ways to modify their grazing rotation so as to leave pastures in better condition year after year. They are never afraid to try new or different habitat treatments and have the insight to wait for long-term benefits"
An Environmental Stewardship Tour will be held Wednesday, June 21 at the Garrett Ranch. For more information, visit http://www.wysga.org. 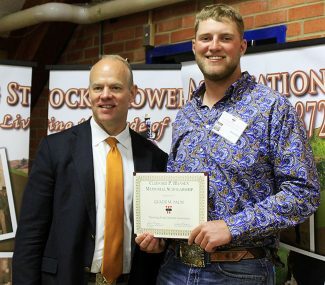 • Clifford P. Hansen Memorial Scholarship — Quade M. Palm, a University of Wyoming student studying animal and veterinary science with a concentration in production. The family ranches near Medicine Bow, Wyo. • Guardian of the Grasslands — Philip Ellis, who is past WSGA and NCBA president and a Chugwater, Wyo., rancher. • Outstanding Range Professional — Jim Mischke, the district conservationist for Hot Springs County. — Eatherton is a freelance writer from Beaulah, Wyo. When she's not writing, she's riding her horse or playing with her grandson. She can be reached at teatherton@msn.com.